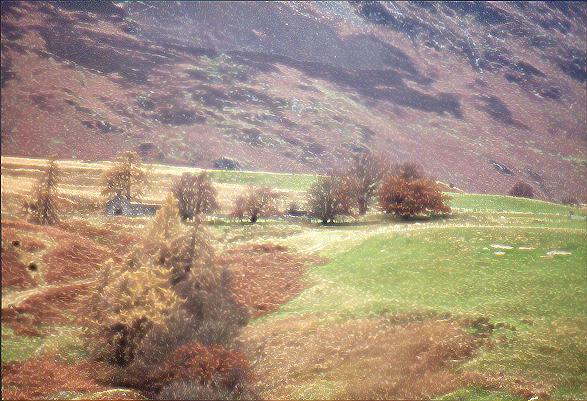 These photos are from my trip to Scotland in Nov'99. I went looking for the BODIE (Aberdeenshire and Banffshire) and DEWAR (Perthshire) lines. The trip was great, successful and I met a lot of people who made me feel very much at home in Scotland. The photos below were all taken in Perthshire looking for the DEWARs. Click on the thumbnail image to see the full size image. After looking at the image use the 'Back' button to get back to this page. It's unfortunate that many of the shots are so blurred. Of course, the days are short in Scotland in November and by 3PM the light was already starting to fade, so the longer exposure time coupled with some long focal lengths has introduced some of the blur (or maybe my camera is mis-behaving?). The blur may also be because I only scanned these shots at 100 DPI (a computer screen only shows 96 DPI) and saved them in a lossy JPG format. The actual photos look a fair bit clearer! Here's Bill Dewar -- Scottish Nationalist, well-travelled man, friends with everyone in the area it seems. He's a great host, great raconteur and great guide. We have been unable to figure out just how his Dewar line connects to ours, but it seems highly probable that it does ... if we go back far enough. 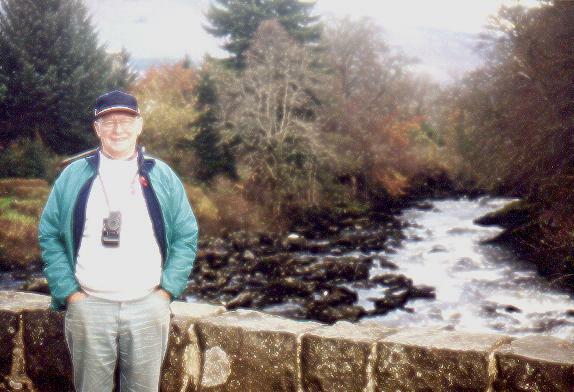 In this shot, Bill is standing on the bridge in Killin over looking the Artney river and falls and a famous graveyard of the McNabb chiefs. Our trip started by driving from Comrie up into Glen Artney, the valley that contains the Artney river. 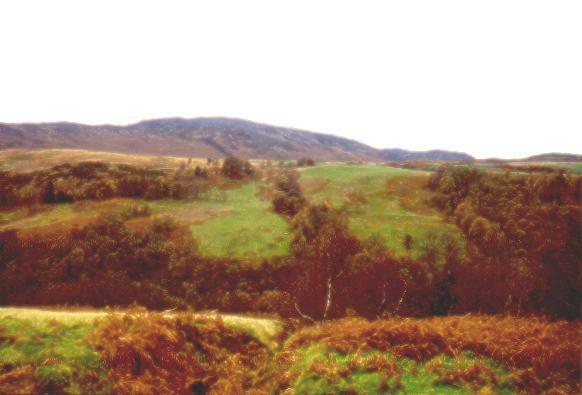 In the battle of 1745 that preceded Culloden, 400 men of fighting age came out of this valley! That's 400 men of ages 16 to 60, so the valley probably supported about 1000 people. The next 3 shots are of the whole valley and it's hard to imagine how it could support that population. Today it is mainly farm land and hunting land owned by one family. 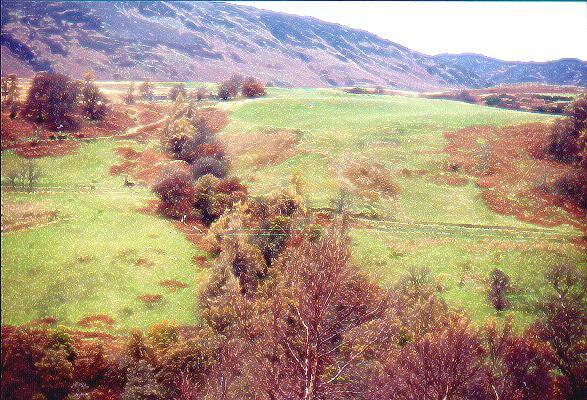 All the pictures of Blairmore are taken from the south side of Glen Artney, looking aross the river. This is the broad view. On the left side of the picture about 1/2 way from top to bottom is a small black structure which is all that is left of the oldest building on the property. It MAY or may not be the original Dewar Croft from the time when Archibald had his sons here before moving to Canada. The main buildings that are left standing are near the top of the picture hidden in the trees as you'll see on subsequent shots. 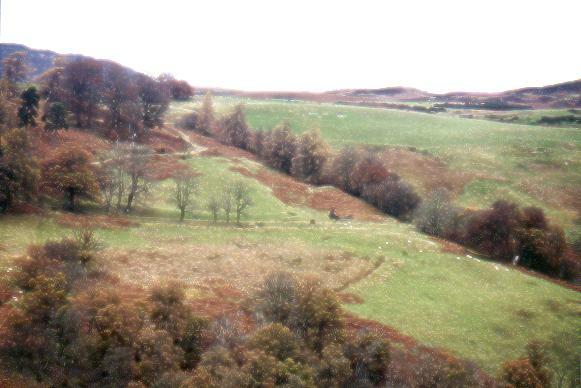 The large green space on the right is the "blair more" or green field that gives this place its name. This is also a broad view from a different angle, and that oldest building right near the centre of the picture is the main point of the shot. This is as close as I could get to the buildings from across the river and valley. At the very bottom edge is that oldest black structure once again. I was able to enhance this shot a little with some computer graphics tools to sharpen the focus a bit. You can see that the main building no longer has a roof (and this means the owner does not have to pay taxes on it!). To the right of the building is a small walled garden. 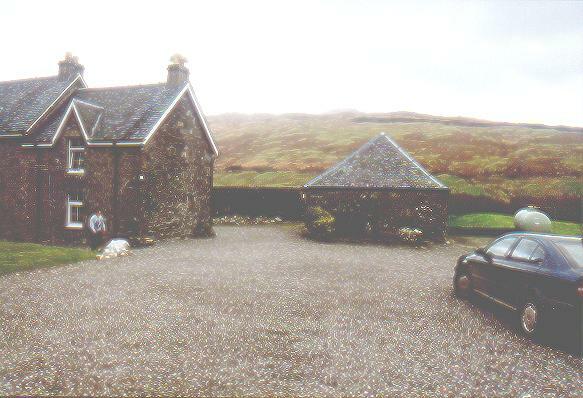 The next shots were all taken around the Ewich House B&B owned by Ian and Jean Walker in Strath Fillan. The building on the left is the Ewich House B&B. The building right in front of you is their garage ... but it used to be the actual Dewar Croft. 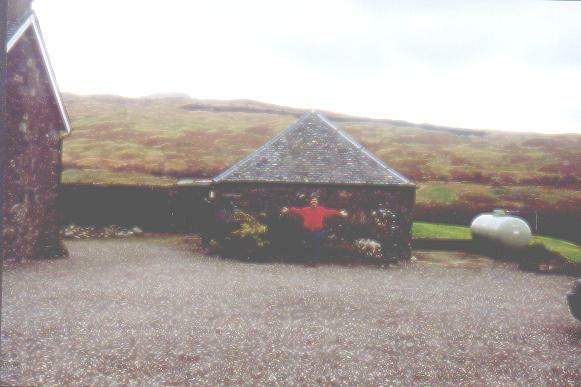 This would have been viewed as a large structure in those days, suitable for the important people who lived there - the family of Dewar Quigrich. It's hard to imagine that 'garage' holding too large a family, and maybe some animals as well. It feels like I can almost reach across it from one side to the other! The area would be about 15 feet by 25 or 30 feet. From the last picture, walking around the croft to the left we see a newer structure (I know, it doesn't LOOK any newer) at right angles to the original croft. I have no idea what that might have been for originally. 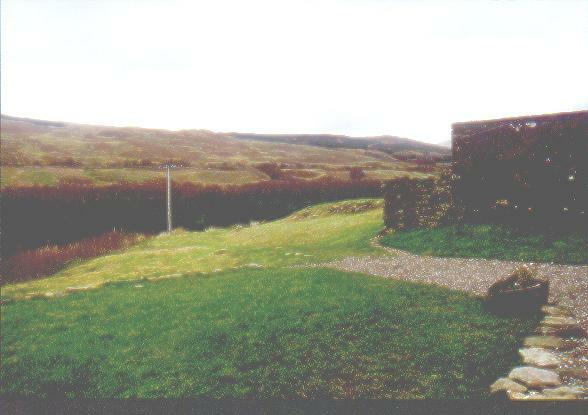 If you continue further around the old buildings, you can see that they are situated at the top of a rise that looks over the strath. 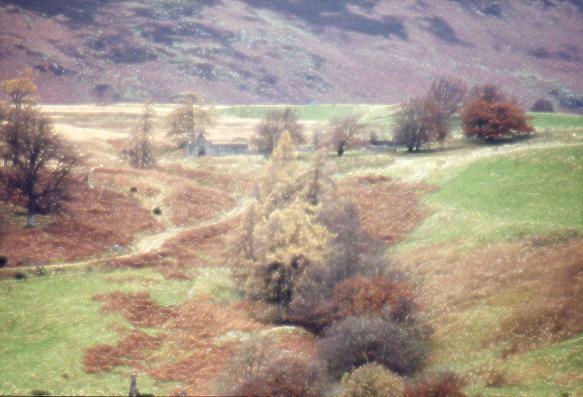 Before the trees down in the valley were planted, this hill top could be seen from anywhere in the strath. That might have made the Dewar site a focal point for communication through the valley, and it was also probably a pretty defensible position if your neighbours became unfriendly. The next shots were all taken near St Fillan's Priory. This is a point in Strath Fillan a few miles upstream from the Ewich House B&B. This plaque explains a little about St Fillan. 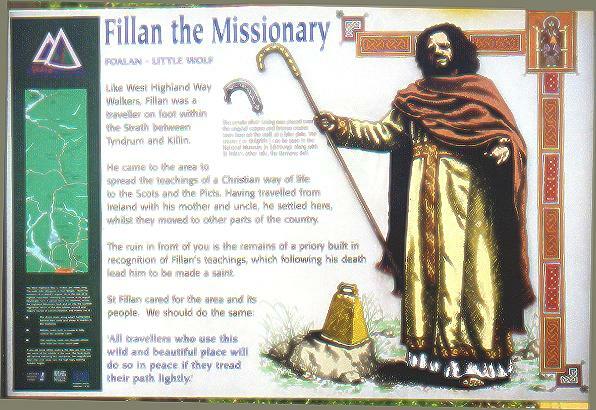 Just in case you can't read the main words, it says: "Fillan the Missionary. Foalan - Little Wolf. 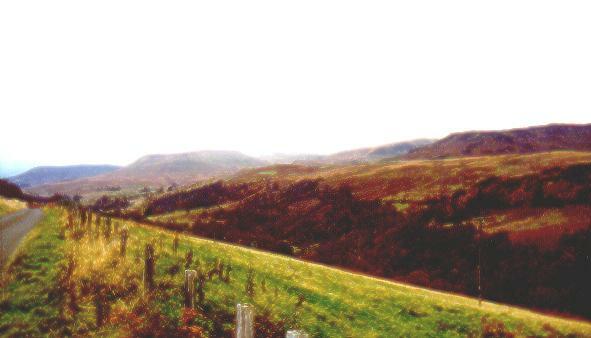 Like West Highland Way Walkers, Fillan was a traveler on foot within the Strath between Tyndrum and Killin. He came to the area to spread the teachings of a Christian way of life to the Scots and the Picts. Having traveled from Ireland with his mother and uncle, he settled here, whilst they moved to other parts of the country. 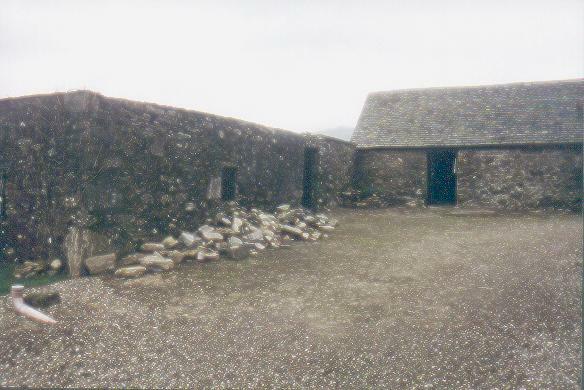 The ruin in front of you is the remains of a priory built in recognition of Fillan's teachings, which following his death led him to be made a saint. St Fillan cared for the area and its people. We should do the same. All travelers who use this wild and beautiful place will do so in peace if they tread their path lightly." 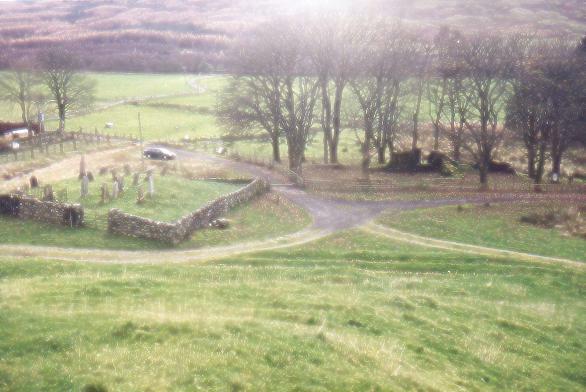 The beautifully kept cemetery was on the hill some distance behind the ruins of the priory. We didn't walk up there to see any details. 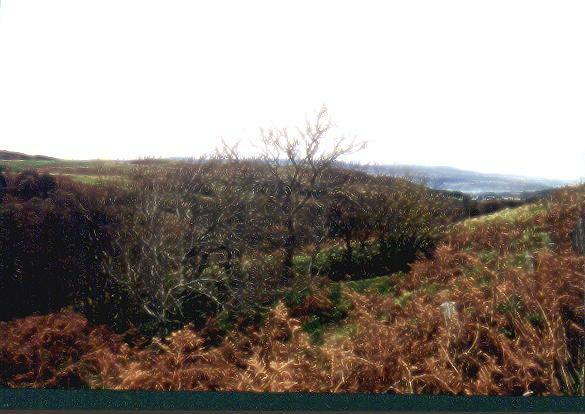 This shot is from the hill partway to the above cemetery. You see the parking lot where we stopped and where the plaque was found. 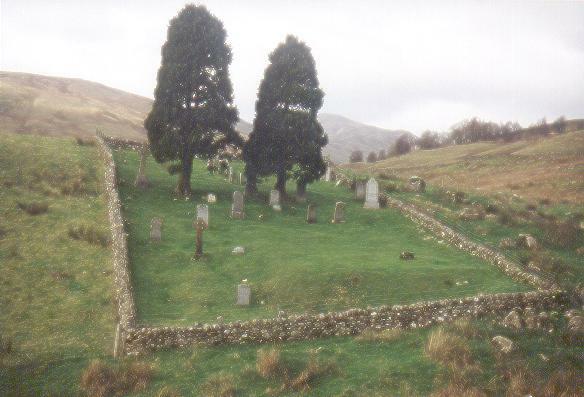 The graveyard close by had many old stones in it - the oldest we could read recorded a man who died in 1752. To the right were the remains of what we assumed was the priory. There were a few grave markers within the fence around the ruins. There was really nothing here that made us feel like we'd found a Dewar thing, but it did give a sense of the faith associated with this saint and by referral associated with the saint's relics that the Dewars carried.